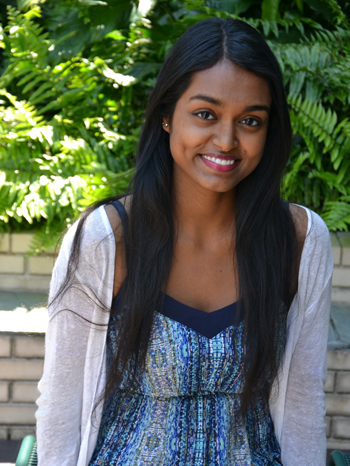 TAMPA, Fla. -- Indira Ranaweera of the University of South Florida College of Arts and Sciences, has been awarded a Gilman Scholarship to study abroad in Spain during the summer 2015 semester. She will be attending the University of Connecticut’s Neuroscience Study Abroad Program in Salamanca. As a student in USF’s 7-Year Medical Program, one of Ranaweera’s main goals is to become fluent in Spanish before she graduates. She aims to use her bilingualism to be a more accessible physician to Spanish-speaking patients, domestically and internationally. Ranaweera, a rising junior in the Honors College majoring in biomedical sciences, is also a very service-oriented individual. She is the current president of the Honors College Student Council, a Student Ambassador for USF Women in Leadership and Philanthropy, and a Morale Committee Member for Bulls for the Kids, a student-run philanthropy that benefits All-Children's Hospital in St. Petersburg, Fla. Ranaweera also is thrilled to soon become a Big Sister through Big Brothers Big Sisters. In Spain, she will be taking the course, Learning and Memory, for her psychology minor, and Medical Spanish. Ranaweera is certain that the coursework combined with the cultural experience in Spain will tremendously help her move towards her goal of becoming a well-rounded physician. Upon graduation, Ranaweera plans to attend the Morsani College of Medicine to pursue an international medicine concentration.